Program Education Center: RECALL WALKER! It is a proud day for Wisconsin. 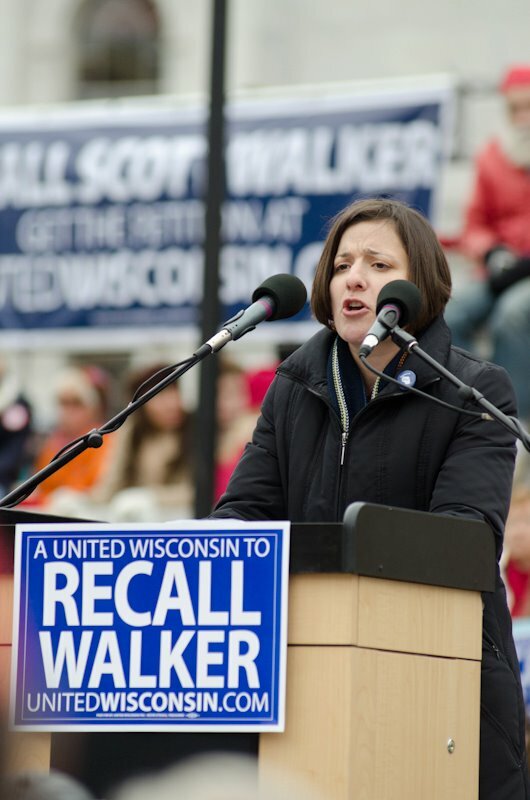 Nearly 30,000 people turned out at the state's Capital for the kickoff Recall Walker rally. I had the distinct honor of being invited to speak twice today--first at the rally in front of Wisconsin Manufacturer's and Commerce, and then at the BIG rally, on behalf of Jobs Not Cuts. It was honestly one of the most awe-inspiring experiences--what a motivated, impassioned crowd. Below, I have pasted both of my speeches. It's my great honor to be a professor of higher education policy at UW-Madison. I’ve worked and made my home here in Wisconsin for the last 8 years, raising two small children, paying my taxes, and educating your children. I am a hard-working teacher, and a researcher who has created more than 2 dozen jobs for the people of Wisconsin over the last 4 years. And this year Scott Walker decided I deserved a pay cut. In September, as I earned my tenure, instead of getting a raise, his policies cut my family’s income. He cut the budget of my employer substantially, and even as we went about teaching the state’s undergraduates this fall, he cut us again. Apparently, for Scott Walker, a college education is something to fear. We are here today to send a strong message to the 1% of Wisconsin and the nation that intends to block educational opportunities for our kids by laying off our teachers, demoralizing our schools, privatizing every public institution in sight, and systematically ensuring that all we have access to is narrow job-training that will make us into the company yes-men that don’t think or act when they are repeatedly crapped on. Scott Walker doesn’t believe in college—he just believes in training. Training people in the skills he and his business friends need so that they don’t have to do any dirty, hard work; training us to accept minimum wage and horrible working conditions and worse yet be GRATEFUL for it. Training us that protest and response is unacceptable, and that we should bow down to the almighty dollar. The WMC has a clear plan: starve the public colleges and universities so that they will beg for help. In return the business community will offer them a prescribed curriculum, and pay them to train automatons. No more critical thinking skills, they want you to do what you are told—nothing more, nothing less. And they want to enlist us teachers in their service, as cheap labor. Look I’m not saying everyone should go to college. But there is NO WAY it is good economic policy for the state of Wisconsin to ensure that the opportunity is blocked. A new report shows that within a few years, 63% of American jobs will be totally unavailable to people who don’t have college degrees. If you only have a high school education, just ONE-THIRD of the jobs you will be able to get will pay a living wage. And the vast majority of those will continue to be open mainly to men, not to women. So by slashing and burning down our colleges and universities with $250 million budget cuts $66 million “lapses” in judgment Scott Walker is taking away job opportunities and chances for economic stability from us and from our kids. Enough is enough. We need JOBS not CUTS. We need higher education not ‘corporate training.” We need career prospects not minimum wage. It’s time, now more than ever, to INVEST in our people, grow our skills, and create jobs. Say Yes to Education, and NO NO NO to Scott Walker and his friends-the WMC. Thank you for coming out today to MAKE HISTORY! I'm Sara Goldrick-Rab from Jobs Not Cuts, a coalition that called for a national week of action in which we tell the Congressional "Super Committee" that enough is enough, no more cuts! Earlier today we gathered at Wisconsin Manufacturers and Commerce to raise our voices alongside similar protests in Boston, Seattle, New York and many other cities around the country. We all know what the face of austerity looks like here in Wisconsin. In March, Scott Walker destroyed collective bargaining rights for Wisconsin's public workers –including our children’s teachers-- and drained millions from their paychecks when he slashed their pensions and health care benefits. But there is an even bigger axe coming down from Washington in just a few short days. At a time of record unemployment and poverty, the politicians in Washington D.C. are threatening historic cuts to the country's social safety net. Soon that so-called “Super Committee” will decide the fate of trillions in funding for federal programs that seniors, the sick, the poor, students, workers, middle-class people, women, and others depend on. Social Security, Medicare, Medicaid, education funding, and other social services are all on the chopping block. Make no mistake people-- they are rolling back the New Deal. The politicians tell us that we need to "tighten our belts" and learn to live with "the new normal." They tell us that the government of the richest country in the world is broke. But for decades, these same politicians have bailed out banks, slashed taxes for corporations and millionaires, and wasted trillions on wars carried out to protect profits of Exxon and BP. Those are the same policies that led to massive government debts. Now they want to gut our programs to pay for an economic crisis that Wall Street created. The wealth harbored by the top 1% could pay off all student loan debt, all credit card debt, buy every home foreclosed upon in 2007 and 2008, finance every current mortgage for two years, triple the number of teachers, pay the annual salary of 19 million families and then some! The financial sector is sitting on $2 trillion of idle cash that could be creating jobs. Keep that in mind the next time a politician tells you that our state, or our country, is broke and that ordinary working people have to pay the price. That is why today, all across the country, activists are taking to the streets to demand jobs, not cuts. We're telling Washington hands off Social Security, Medicare, and Medicaid! We won't tolerate any cuts to education or social services! We need jobs, not cuts! Congress should fund a federal public works program to create millions of jobs for the unemployed. We need it now! We want Wall St to pay for the crisis they created, not working people. We know where Scott Walker and his cronies in the Capitol stand on the question of who has to pay for the crisis. But this fight is much bigger than Walker, much bigger than just Wisconsin. Earlier this year Wisconsin showed the country that we won't stand for these cuts, and now the rest of the country is waking up. We are rising up to say "we won't pay for your crisis!" Recall Walker! Recall Walker! Recall Walker!